These two new valve units offer unusually powerful processing for professional studio use. The Danish company Tube-tech recently celebrated their 20th birthday, making them just slightly older than Sound On Sound, and the reason they're still around is that they build exceptionally good kit, albeit at a premium price. If you want tube preamps and processors that deliver the goods sonically, then Tube-tech's range has always been a good place to start looking. The two units under review here are, like all Tube-tech processors, impeccably engineered, with retro Bakelite-style knobs, metal switches, and red power lamps that could double as aircraft warning lights! 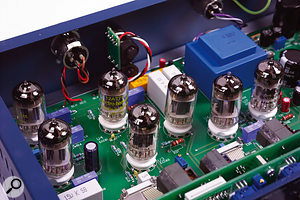 Tubes are used throughout the audio path — no hybrid circuitry here — and mains is fed in both cases through conventional IEC inlets with adjacent fuse holders and 115V/230V voltage selectors. The MEC1A recording channel is a combined mic, line, and instrument preamplifier combined with an equaliser and an optical compressor. To the left of the 2U processor's front panel is the preamp section. The mic signal enters via a screened step-up transformer, giving it a 10dB boost before it hits the two dual-tube preamps that provide the rest of the gain. A pair of rotary gain switches with 10dB and 1dB steps respectively provide a total gain of 20-70dB. Switchable phantom power is included, along with a 20dB pad and a phase-reverse switch. The low-cut filter can be set at 20Hz (12dB/octave) or 40Hz (6dB/octave). The microphone input can handle levels of up to +6dBu without the pad, so with the pad switched in line-level signals up to +26dBu can be accommodated. The high-impedance DI input jack is unbalanced and is located on the front panel for easy access. It feeds into the preamp circuitry directly after the input transformer, and plugging into this socket disables the mic input. The gain range for this input is 10-60dB. Both the mic and line inputs share the same XLR input on the rear panel, where you'll also find the balanced XLR output. There are no insert points or direct outputs from the preamp. The equaliser comprises low and high shelving-filter sections and a switched-frequency mid-band, which is controlled via a rotary 20dB gain control and a cut/boost switch. There are 12 mid-band frequencies between 40Hz and 10kHz, and an uncalibrated bandwidth control. Both the shelving and peaking filters employ a dual-tube operational amplifier topography, and both the low and high shelving sections have six switchable frequencies (20-160Hz and 4-26kHz) with a ±15dB gain range, again achieved using a cut/boost switch. The equaliser can be bypassed when not in use. Following the equaliser is an optical compressor, though a switch in the master section can place the compressor before or after the equaliser in the signal path. The compressor may also be bypassed when not in use. A toggle switch selects between manual or fixed attack and release times (in fixed mode the attack time is 1ms and the release time is 50ms). An Output Gain control offers up to 10dB of gain make-up, while a moving-coil VU meter can be switched to read the output level or the compressor gain reduction. Two TRS jack sockets on the rear panel allow you to link the compressor side-chains of multiple units for ganged operation. By using the front-panel Link 1/Link 2 switches, the user can decide which of the daisy-chained compressors should be linked, in two possible groups, without having to do any re-patching of the TRS sockets. The attack, release, threshold, and ratio are set by whichever unit is working hardest, so the threshold should normally be set fully anticlockwise on the slave compressors. The ratio and gain settings on the slaves should be made the same as those on the master unit for proper operation, but the attack and release controls on the slaves have no effect in this mode. However, as I only had one unit for review, I couldn't test all this myself. The 2U MMC1A is a bit of an odd product, in that it combines a mic preamp with a multi-band compressor. Although multi-band compression is usually associated with mastering, apparently engineers have found that Tube-tech's previous multi-band compressors sounded great on vocals, so they talked the manufacturer into building the MMC1A. The mic preamp again utilises a screened input transformer to provide the first 10dB of gain, and this is followed by two dual-tube preamplifiers. The gain is set using the same pair of controls, for an maximum gain boost of 70dB, and the mic and line inputs are both on balanced XLRs on the rear panel. Output is via another balanced XLR. The microphone stage has a switchable 20dB pad, 48V phantom power, phase reversal, and 20Hz or 40Hz high-pass filtering. Unlike on the MEC1A, the mic input impedance of this unit can also be switched between 600Ω, 1200Ω, and 2400Ω to suit the mic being connected. A high-impedance, unbalanced DI input (0-60dB gain range) is again available on the front panel. After the preamp, two crossover networks split the signal into three frequency bands for feeding to the compressor. The filters are each based on simple circuitry to preserve accurate summation of the three bands at the output after compression. There's no insert point between the preamp and compressor, which some people might have found useful. The lower crossover frequency is continuously variable from 60Hz to 300Hz, but also has a x4 multiplier switch taking it to a range of 240-1200Hz. The upper crossover frequency is variable from 1.2kHz to 6kHz. In all three bands, the compression ratio can be switched between 2:1, 5:1, and 10:1. Each of the bands is controlled from its own side-chain, and after compression the three signals are fed to separate gain controls before being recombined and fed to the master Output Gain control. The compressors utilise an optical gain-management system and have rotary controls for ratio, threshold, attack, and release. Bar-graph gain-reduction meters are fitted to each band showing the gain reduction from zero to -20dB in 11 steps, but there's no overall output-level meter. There's also no level meter for the mic preamp, so I guess the thinking behind this is that you watch the meters on whatever the MMC1A is feeding and adjust the levels accordingly. Even so, I would expect a processor of this quality and sophistication to have all the necessary metering, as that's really the only way to optimise the gain structure properly. A toggle switch allows the compressor to be bypassed. Although the circuitry uses tubes, which are traditionally noisier than solid-state components, the use of an input transformer has kept the noise down to a level where it is insignificant for most practical purposes, especially in the studio, where few things are miked from any great distance. The mic preamp sound is solid, confident, and open without seeming coloured, but one practical point that worries me slightly is that both the mic and line inputs share the same socket, so it would be all too easy to switch on the phantom power with a line-level source connected. I can imagine some pieces of gear not taking kindly to phantom power being stuck up their output! I loved the sound of the MEC1A's equaliser, especially when using the mid-band for cutting in the 1kHz-1.5kHz region to smooth out vocal harshness. However, having to switch between cut and boost feels unnatural until you get used to it. I can't argue with the sound though — it does exactly what a good equaliser should, and adds polish, punch, and clarity to a sound without you having to add very much at all. The same is true of the compressor, because although it does flatter the sound in some ways, it also manages to sound very unobtrusive, keeping tight control over the vocal level in a very effective way that leaves you wondering whether it was actually compressed or not. You can coax more attitude out of it by hitting it hard, of course, but it is surprising how much gain reduction you can apply before you give the game away. When it came to the MMC1A, I wasn't entirely sure what to expect from a multi-band compressor designed for vocals, but it turned out to be a useful problem-solver as well as a creative tool for setting up larger-than-life vocal sounds. For example, if you have a singer whose vocals tend to get very honky and nasal when they sing loud, you can use the crossover filters to bracket the area between 1kHz and 2kHz, then apply more compression to the mid-band by increasing the threshold. The louder the singing, the more the mid-band gets squashed, so those honky frequencies are suppressed. Need a more intimate vocal sound? No problem — set the upper crossover to 4kHz or above, then apply more compression to the top band and balance the levels accordingly. During quieter passages, the top end will open up and become more breathy, but when the level increases the compressor steps in to keep it under control. Like most multi-band compressors, the MMC1A works like a combined compressor and equaliser, because balancing the contributions of the three bands is effectively EQ'ing the signal. With just a little practice, you can enhance just about any vocal in a musical and creative way without the processing reducing the clarity or focus of the sound at all. Light voices can be given more low end density by adding extra compression and gain to the low end, while the magical airy quality associated with top-division studio recordings is easy to achieve. In all this is a lovely box, and the preamp is just as solid and transparent as that of the MEC1A. My only real concern is over the miserly metering. I love the effortless way the MEC1A enables you to polish a sound without spending ages readjusting the controls. If I dealt with top-division vocalists on a regular commercial basis, then the MEC1A is one piece of kit that I'd very much like to have on my side. The MMC1A impressed me even more with its extraordinary ability to coax different sounds out of the same mic. It was like having a cabinet full of different mics to choose from! This unit can turn a good vocal recording into a glorious one, and it's interesting that, although you do need to record your vocals in a suitably treated room (the compression will just exaggerate any boxiness), you don't have to be using a world-class microphone to hear the difference. But let's not beat around the bush — both these units cost a packet. Here in the UK you could buy a fast computer, an audio interface, a capacitor mic, a passable preamp, and some audio software for the same money, and still have enough change for fish and chips on the way home from the shop! Nevertheless, if you're in a professional situation where recording impeccable-sounding vocal or instrument parts justifies the outlay, then there's little not to like about these units. In particular, the MMC1A stands out from all the esoteric gear I've tried over the past few months as being something a little bit special, producing more creative results than the usual raft of signal processors we use on a daily basis. More metering would be useful in places. Shared mic/line input invites phantom-power mishaps. Built like a tank, but a very good-looking tank! Could use more metering, specifically in the preamp section and on the output. I wouldn't normally think of using multi-band compression on vocals, but after trying this box I'm sold on the idea. It is a lot of money, but within its league I think Tube-tech have a winner on their hands. MEC1A, £2889.93; MMC1A, £2889.93. Prices include VAT.